For most golfers in Scotland, this is a special time of year. Like a rite of spring, the Masters at Augusta looms and out come the golf clubs again, still scuffed and bruised from last year but lovingly wiped down. The first major of the season quickens the pulse, makes men and women go out and book their local tee-times and is really the unveiling of the new golf season. Up and down Scotland, we are reminded again that we live in a kind of golfing heaven, with courses to die for all over our country. I was amazed to read recently that 4.5% of the population of Scotland are either members or affiliates of golf clubs. This is a huge slice of the demographic, amounting to about 240,000 people, and this at a time when golf club membership across Britain is supposedly in crisis. Evidently the Scots are still in love with the game they gave to the world. We have 600-plus courses in this country, many of them of an incredibly high standard, and over these ensuing months of spring, summer and autumn, hours of joy will be had in this deep-rooted national pastime. At Augusta, they know all about the joy of early spring. This medium-sized town close to the Georgia-South Carolina border is unremarkable in many ways, save for the jewel of a golf course constructed by a Scot, Alister MacKenzie, over an old indigo plantation in 1932, which gave rise to "The Masters Invitational Tournament", the event's original name. Back then, in post-Depression America, the early years of the tournament attracted jobbing professional golfers who happily decamped to Augusta to take in the new championship in the hope of picking up maybe $100. But then, almost miraculously, the event grew in prestige, for three main reasons. First, the golf course was so beautiful. Second, in Bobby Jones from nearby Atlanta, the tournament had a well-known and lauded advocate. And third, in the 1960s, come the arrival of Arnold Palmer and Jack Nicklaus, "The Masters" took off in the TV age, with golf's new superstars really embracing the challenge. This year there will be no Tiger Woods at Augusta. After 19 straight starts, Woods, in the latest setback to his career, has undergone back surgery that ruled him out. I was sitting in the Augusta press conference in 1995 when Jack Nicklaus, in hailing the new, prodigious Woods, claimed Tiger would: "Win more Masters than me and Arnie put together." At the time, it was a breathtaking claim to make. Nicklaus won six Masters and Palmer won four, so Nicklaus was in effect saying that Woods would win a minimum of 11 Green Jackets. Two years later, when Woods won the first of his four Masters so far by 12 shots, the claim didn't seem quite so outrageous. Since then, other aspects of Woods' life have conspired to beat him. Unbelievably, he hasn't won a Masters since 2005 and hasn't won a major since the 2008 US Open. It has been a jaw-dropping halting of the bandwagon. Given Woods' current pace-setting, you have to say Nicklaus' record haul of 18 Major championship wins looks untouchable. 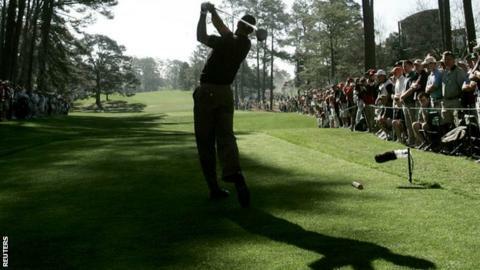 Woods was a Masters debutant back in 1995 at the age of 19. This year, at 39, Scotland's Stephen Gallacher makes his maiden bow at Augusta having barged his way into the world's top-50 in recent months. It will be an exciting challenge for Gallacher and his rush of form could not have been more timely, in this, a Ryder Cup year, with the match to be staged in Scotland in late September. Over the next six months on BBC Radio Scotland's Golf Show, I will be covering these and many other themes with a variety of guests on a Sunday morning. Amid all of Scotland's other dramas in 2014, the year is shaping up to be a momentous one for golf and we aim to cover it every step of the way. The Golf Show, presented by Graham Spiers, airs every Sunday morning on BBC Radio Scotland at 1030GMT.